Is Google My Business a tool animal shelters and rescue organizations should explore? Absolutely, says Lindsay Layendecker, Senior Manager of Education and Outreach at the Jacksonville Humane Society. Google My Business is a free service that allows businesses, as well as nonprofits, to create customized information, posts, events, hours, and other features to accompany their listing when it appears in a user’s Google search results. 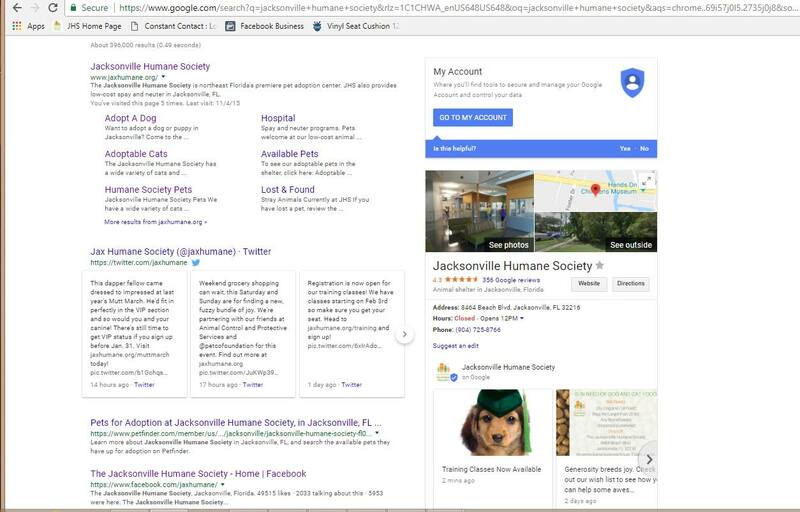 And unlike Google’s floundering social media service, Google+, Google search is definitely not going anywhere — making it well worth a look by animal organizations looking to increase traffic to their adoption listings and fundraisers, as well as increase public awareness of their work. Layendecker first became interested in alternatives to Facebook and other traditional social media channels after reading a Maddie’s Fund® blog post about how changes at Facebook are affecting animal organizations. Ready to get started or just want to explore? Learn more about Google Business here!